Whatfettle ⁓ Part One: Who Am I? Hello. I’m not Bruce Schneier, who you should follow if you’re at all interested in security and identity. Rather I’m just a random guy with a blog. Someone with a presence on, a personal investment in, and who likes to garden this precious space we call The Web. The metaphor of The Web comes from linking. Without links there’d be no Web and certainly no Google, whose business was established by finding, following and ranking the relationship between places on the Web. This example uses the rel attribute, but by and large most of Microformats are commonly used class names, making them a little like colours on a Web page agents can see. There are a number of browser extensions and bookmarklets to reveal names, addresses, and relationships encoded on a page, for example chrome, operator and rel-lint. My linking to lots of sites from my blog, and back to my blog from lots of sites seemed like a good strategy for building a strong presence for me on The Web. Unfortunately over time several of the sites I linked to have died or redirect somewhere unexpected, and my blog posts are often reposted up by spam-farms, including the XFN links. Which may explain why several friends have reported Google profiles displaying my Flickr account as being theirs, the social graph search for my blog currently returning nothing of use, and my huffduffer “elswhere” section being empty. 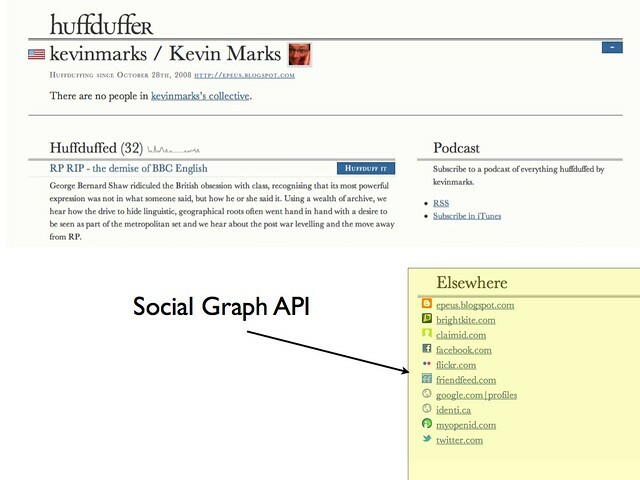 The API search does, however, still seem to have some useful, though duplicated results. Something, somewhere at some point went bang. 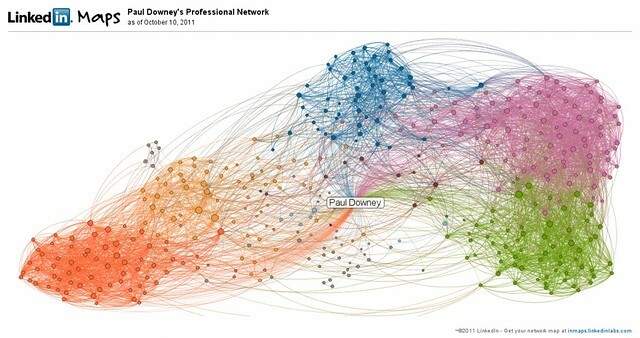 So for now my linkedin, Twitter and Facebook graphs are more compelling to look at. That’s not to say social graphs in the open aren’t as cultured or useful, just that they’re harder to tame than those grown inside a walled garden. The question is why I would want a “strong identity”, and it’s one I can’t easily answer. Most anyone with a presence on The Web has at some point had a bad experience with someone out there. I like to think building a good reputation and a strong digital identity can help should you encounter real trouble, but like my broken social graph that could be a tower of sand and digital natives with stronger identities than mine have had cause to abandon and even remove their claims, leaving the rest us to suffer a form of digital bereavement. A Whatfettle article by Paul Downey published Monday, October 17th, 2011, at 4:10 pm under a Creative Commons License.